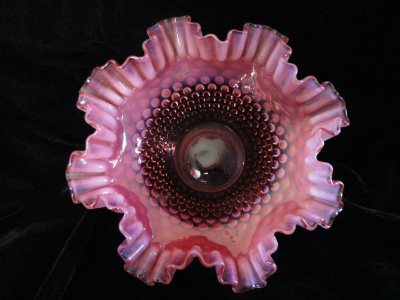 Showcased in the 1950 Fenton Hobnail Catalog, this large pristine vintage Fenton art glass cranberry opalescent ruffled hobnail bowl piece is described as # 389, 11 Inch Vase, and sold for $2.75! Also in this catalog, Fenton stated that they were the only plant in America producing gold ruby, which is the beautiful cranberry colored glass our wonderful vintage art glass cranberry opalescent hobnail bowl was made from. The catalog further states: Cranberry opalescent gold ruby cased with French opalescent glass is not a stain or decoration, but is actually embodied in the glass and is obtained by the addition of gold coin to the glass batch. Handmade in the USA, this pristine vintage cranberry opalescent ruffled hobnail bowl is a beautiful example of Fenton art glass and the masterful artisans in their employ. The art of opalescent glass is all but lost due to the difficulty of the process - and few, if any - manufacturers of glass create opalescent glass today. In excellent condition, this vintage Fenton art glass cranberry opalescent ruffled hobnail bowl actually measures 9 1/2" wide and 4 1/4" high. The opalescent hobs are in perfect condition and graduate evenly from light to solid white until they meet the cranberry ruffle. 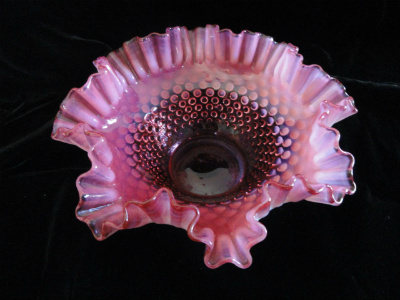 This wonderful vintage Fenton large cranberry opalescent ruffled hobnail bowl has no chips, cracks, or any other blemishes. There is no signature or makers mark on the bottom, which identifies this bowl to a manufacture date before 1970.